When nature and infrastructure collide, things can get slippery. In 1953, Australia got some accidental tourists from Portugal: millipedes. Black Portuguese millipedes, to be specific, which are known not only for their distinctive black shell, but also for the terrible odor they emit. Since then, the millipedes -- aided by the fact that, in Australia, they have no natural predators -- have made themselves at home in their adopted country. So much at home, in fact, that they have flourished (often reaching "plague numbers," some scientists put it). And the worm-like creatures have, in the process, became pests to the country's human residents. The latest example of Australia's thousand-footed pestilence may be one that involves nothing less than the country's infrastructure. Yes. Earlier this week, 25 miles north of Perth, a train pulling into a station in the town of Clarkson ended up rear-ending a train that was parked at the station. And Australia's transit authority is blaming the accident on … the millipedes. The creatures have a tendency to hang out on train tracks, it seems, their shiny-black exoskeletons acting as perfect camouflage. And when a train comes along, they … well, you know. And when there are a lot of millipedes being squished at the same time, that leads to tracks that are much less friction-filled than normal. "The train loses traction and the train has slipped," explained David Hynes, a spokesman for the Public Transport Authority of Western Australia. Or, as Australia's Minibeast Wildlife puts it: "The mush and oils from millions of dead millipedes on the tracks caused the trains to lose traction." In this case, the effects of a track suddenly acting as a biological Slip-n-Slide were minor. “There was one train at the platform and people were getting on and another train came up behind it and bumped into it,” Hynes put it. “It was like a very bad park, as if someone just bumped into the car in front of them." Which is, all in all, a good outcome, considering. But its seems pretty clear that millipedes were, indeed, to blame for the low-speed collision. "Hundreds of the creatures were found squashed in a slippery mess on the track," SkyNews reports. And this wouldn't be the first time that millipedes were the culprits in train problems. 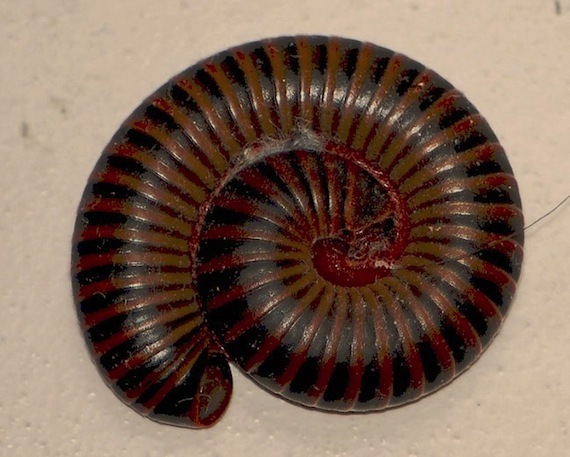 In 2002, Minibeast Wildlife notes, "There were so many Portuguese Millipedes on the train lines between Melbourne and Ballarat that 50 trains were prevented from running." And in 2009, thousands of the millipedes overtook more than a mile -- more than a mile! -- of track near Melbourne, causing train delays and cancellations. "What happened in previous instances," Hynes said, "is trains which were traveling at speed have gone over an infestation, crushed them and made the tracks slimy." In the case of the Clarkson crash, six passengers were treated for neck problems following the collision, and that seems to be the extent of the human toll. But the accident led to a circumstance that serves as a nice reminder of how intimately connected nature and infrastructure are, even in the highly developed world of 2013. The Public Transportation Authority of Western Australia is now conducting an inquiry on the creatures' effects on the train tracks. They're calling it a "millipede probe."